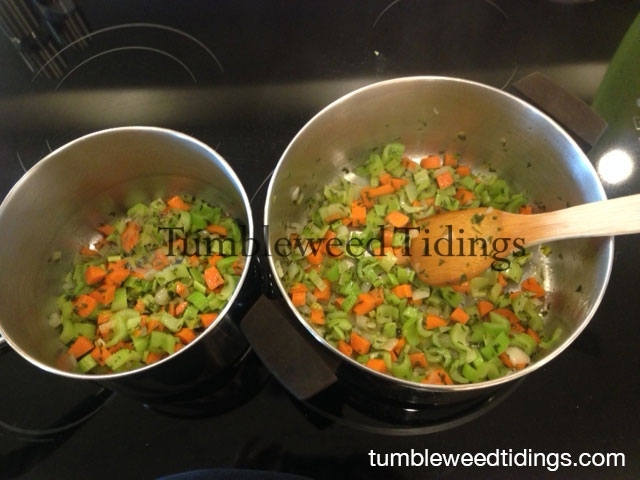 A Tale of Two Soups……. 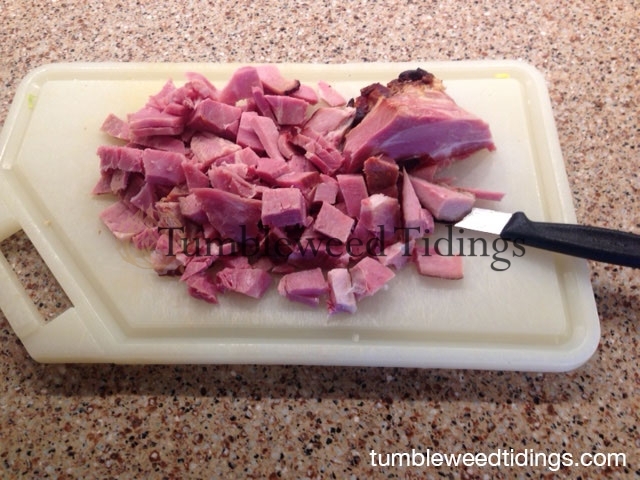 What do you do when you have leftover ham in the freezer, fresh vegetables in the crisper, a husband who likes split pea soup and a wife who prefers ham and bean soup? Why you make both, of course! Before you say that sounds like too much work, you won’t believe how easy it is to make multiple dishes with some of the same basic ingredients. 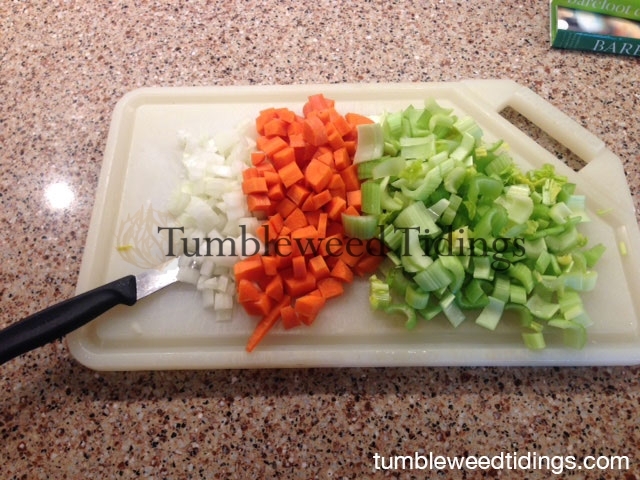 Most soups, stews and many casseroles begin with a mirepoix, French for the Holy Trinity of cooking, which includes onions, celery and carrots. Variations can include peppers and other seasonings, and it is commonly found in Louisiana cooking. Once the chopped vegetables are sautéed in butter and olive oil, you can split them between two pans and proceed from there. Add the stock, parsley, seasonings and ham. At this point, the two pots are exactly the same. Now this is when you can personalize them into two distinct soup recipes! For the ham and bean soup, just add three cans of navy or great northern beans….whatever you have on hand. You can also use dried beans, and either soak them overnight or do a quick soak the day of. For simplicity this time, I used canned. Voila! This one is done and just needs to simmer until dinner. The two soups are now ready to feed a crowd, put in containers for the freezer, or have immediately for lunch or dinner. So the next time you are slicing and dicing for a recipe, you might consider how these base ingredients could be used to make another variation at the same time. It is a smart way to save time and money, as well as using up leftovers; always a plus with our often hectic lives. Just add a salad and rolls, and dinner is served. And that’s the tale of two soups! 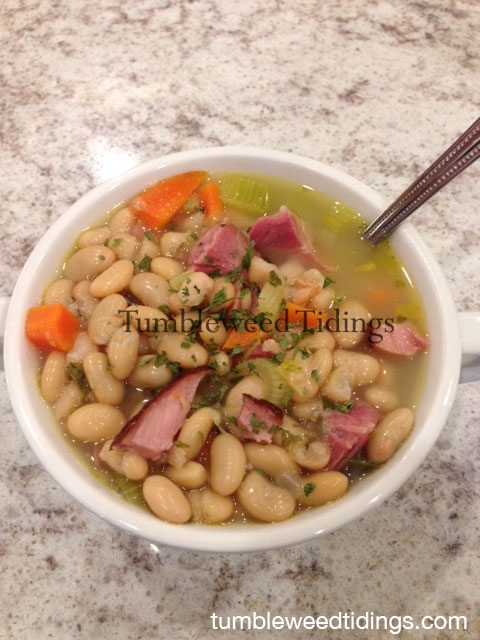 For the ham and bean soup, add 3 cans navy or great northern beans. Simmer until warmed through and serve. 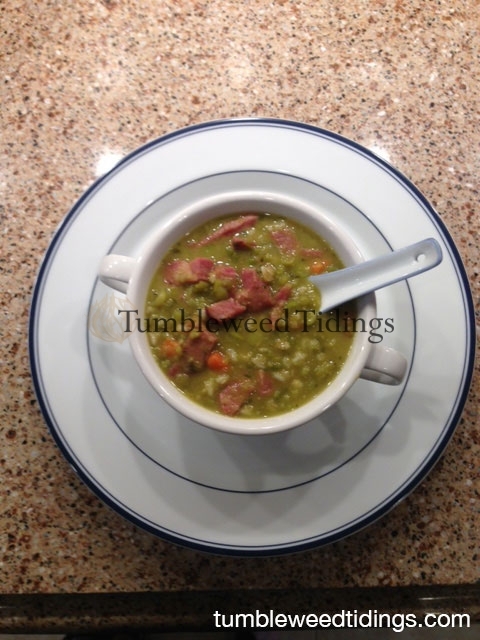 For the split pea soup, add 1 cup dried split peas and ½ cup dried barley. Simmer for 2 hours. Add 1 cup split peas and simmer another hour. Serve and enjoy! These are fabulous !!! You have the start of a cookbook right here.